Good Wednesday Morning Ya’ll. Hope everyone is enjoying their week! It’s actually my B-day today, whoo hoo for 32! It’s weird because I don’t feel much older than when I was in high school! It’s just a number right!!?? Yes, another Halloween has come and gone and sure enough I had a whole bowl full of mini Milky Ways and 3 Musketeers left that I wanted to get out of the house. Being the cookie lover that I am, I thought, why not just toss all the candy bars into some good dough. Let me tell you, I am not a huge fan of these candy bars by themselves, but Whoa are they good in cookies. The nougat and caramel makes the cookies chewy and ultra soft. I might even be tempted to make these babies all year round, that’s how much I liked them. So, give them a whirl, and if your family is anything like mine, those are the 2 candy bars that are left at the bottom of your Halloween bowls! Take a peek and enjoy!! 1. Preheat oven to 350 degrees F. In a stand or electric mixer cream the butter and sugars. Beat in eggs and vanilla until well combined, scraping edges with a spatula. In a separate large bowl combine the flour, baking soda and salt. Slowly add to wet ingredients along with the chopped candy bars. 2. With a medium cookie scoop, scoop onto a silpat or parchment lined baking sheet. Bake for 9-11 minutes, or until cooked to your preference. Let cool for 5 minutes on baking sheet then transfer to a cooling rack. Come back soon for another Pomegranate Giveaway!! Have a great week!! My kids got junk candy, mostly toosie rolls, chewy junk and nestly crunch minis, yuk. No leftovers recipes from me. YAY! You and my sister are the same age. Those look super yummy, I was wondering with thanksgiving coming up do you have a good recipe for stuffing? Happy Birthday Jenny!!!!!!!!!!!!! !Hope you have a wonderful day! As wonderful as sweet as these cookies! YUM – the cookies look fabulous! Great way to use up the candy. Today is my birthday too!!!! 11-12 is a great day for a birthday in my opinion! Happy Birthday and the cookies look SO yummy! That caramel in the cookie looks too good! These cookies look so chewy and gooey, yum! happy birthday jenny! hope you had a good one…those cookies look delicious – i need to get milky ways now! I love those candy bars but only as mini’s. What a great way to use up the candy you have left! I may have to try that with some of our leftover candy!! Milky ways are my fave candy bar. Can you believe my 7 year old only came home with one mini-sized milky way this year? I tried to send him back out to get some more but he was beat! No 3-Musketeers either. Weird. 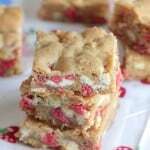 I love candy bar dessert recipes of any kind- these look great! Happy Birthday, Jenny. Your years become you, you wear them well. These look so gooey delicious. What a great way to use up the last of the treats. Oh, fantastic! Those cookies are droolworthy! Happy Birthday! These cookies look great. I might try them out this Sunday to take to our college group at church. I love both of those candy bars… but then again, I’ve hardly met a candy bar I didn’t like. Happy Birthday! Milky Way is my favorite candy bar. I know I would love these cookies! My heart just skipped a little beat! Be blessed and have a great birthday! Happy Birthday! What a great way to use the candy!! I love the cookies! Happy birthday. My 22nd is tomorrow. Very exciting! Have a great one! I’m amazed you have any leftover candy…my kids gobbled theirs up pretty quickly…it’s gone. This recipe makes me wish I had some left so I could try it!! Happy Birthday Jenny! Hope it’s a good one for you =) These look so yummy, i’ll have to give them a try! Happy birthday to you….happy birthday to you…..I’ll spare you any more singing……trust me, THAT’S a gift!!! And I totally agree with you Jenny-age is just a number…. Happy Birthday! I love Milky Ways. These are amazing! Those look fantastic! Happy Bday! Happy Birthday! Trust me it just gets better! Yummy cookies. What a fun way to recycle those chocolates :)! Happy Birthday, hope it’s sweet and delicious! Happy Birthday! What a yummy birthday treat you whipped up! Happy Birthday!!!! Hope you do something fun today! Those cookies look great… I’m going to have to give them a try (but, I have to sneak into the Halloween candy jar to get them w/o the kids noticing!). Jenny I hope that you have a wonderful birthday!!! I would just curl up with a plate of these cookies and a good book or a good movie . . . watch my house fall apart and just relax!!! Your cookies look so good! I am debating making cookies today myself . . . we’ll see what happens! Have a wonderful day!!! This is so funny to me. I have been looking at the huge bowl of leftover Halloween candy for a week and wondering if I could put them in some sort of cookie. These look great! Hope you have a happy birthday! Great idea with the candy in there. HAPPY BIRTHDAY!!! Happy birthday!! Enjoy your day. Cookies look amazing. I’m not a big candy or choc bar eater so I know I would like these cookies more than the bars alone too. They look delicious!!! Happy Birthday! I totally know what you mean that you don’t feel any older than you were in High School. My 30th is coming up in 2 weeks. Thes cookies look great! Happy birthday!!! Hope you have a very special day! Hope you have a great day and your cookies look great! I love almost any candy bar! Look at this, you give us a gift by posting a recipe. Whatever your plans are, I hope everything goes great! Happy Birthday to you!!! These cookies look amazing. I have a bunch of snickers…any ideas? I guess I could just do the same thing just with the snickers. Thanks for the idea. Awww Happy Birthday sweetie! yes, it’s just a number. I gave away all my Halloween candy…too dangerous to keep around me. But glad you made really good use of yours. I love the chunk of candy bar in the middle pic. YUM! I made the Pumpkin Spice Blossom cookies you posted last month and they were amazing, thank you for posting that recipe. Happy birthday! You are still a baby! Great cookies and I love the name. Happy Birthday Jenny!! At 32 your still a pup!! I’m bookmarking these cause I would hate myself if I didn’t make them!! Happy Birthday! This is definitely a better way of dealing with Halloween candy that just eating it! I’m not a Milky Way fan, but those cookies sound deeelish!